Adventure is whatever brings you closer to doing something you would never do, and hopefully enjoying it along the way! I can truly say that my wife and I enjoyed the time we had with Whirlpool Jet Boat Tours in Niagara Falls. We were given an opportunity to ride the Jet Boat on May 24th. We went at the 11am time slot, and departed from the Niagara Falls on the Lake location. The experience was amazing! I can’t say how much we truly enjoyed this. The staff at Whirlpool Jet Boat Tours helped make this an event that went smoothly, and they really made us feel important. From the moment you checked in, you felt like they truly wanted you there, and they were going to make this as exciting as it possibly could be. You had to sign a waiver to get started. I can understand this, they want to make sure that you understand that it is going to be a bumpy and fast ride that might not be suited for everyone. 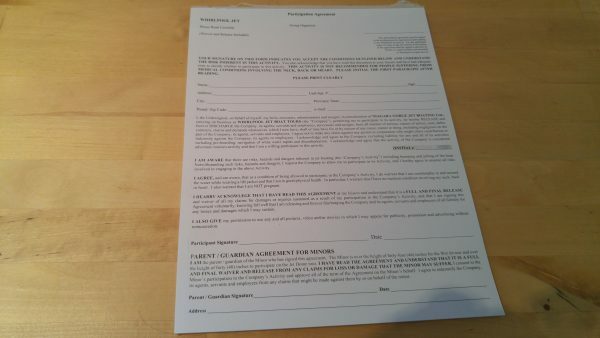 Check out a picture of the waiver below. Now that we signed and said we still wanted to do this, we went through some informational and safety info with Jean Marc who was our tour guide for the trip. I can’t say enough about this guy, he was friendly, fun, and made the whole experience what it was for us. He was instrumental in explaining all the things we saw along the boat ride, and kept us safe while we were doing it. Check out the video below from my GoPro of him going over some of the safety features we needed to know about for our boat ride. He was very thorough and did an excellent job. Now Jean Marc wasn’t the only staff member who made this experience possible, there was a number of people who helped keep us safe, and made this the fun event that it was. One of those exceptional people was Kelli Klassen, she shined in ways that made us smile, and kept everything flowing the way it was supposed to go. She had an infectious smile, and was responsible for taking pictures of the whole process for you to buy if you wanted. All though we didn’t buy any pictures as I took my own, she displayed professionalism and had an amazing attitude that made this very special for me. I truly enjoyed meeting her, and I wish her luck in her pursuit to become a Nurse. Let’s check out one of the videos below that I did on my Go Pro. This is me and my wife Michelle, and it truly shows the joy and fun that we had on this ride. It was exhilarating and filled with lots of water splashes that you can see in some of the videos below near the end of the post. There were some major bumps as the boat hit the water, so be prepared for that, but other than that, it was a mixed pace of slow and fast that led to lots of thrills. They have 3 locations to depart from. Two are on the Canada side, and one is on the United States side. We took off from the location in Niagara on the Lake. Children 6-13 are $51, and 13 and up are $61. This experience is worth it. While our tickets were given to us for the purpose of this review, my opinions are my own, and I can truly state, I would pay to do this again. They have two boat options, opened and closed. If you don’t want to get wet, but want the excitement of the ride and getting that close to the rapids then you have to take that option. If you want to get wet, and want the excitement of getting soaked then the open boat is your best bet. I want to do it again! We go to Niagara Falls on the Canada side every year. We just love all the activities and things you can do there. This is definitely on our Top 5 list of things to do while we are there now. I want to thank all the staff that made this possible, without them the boat and experience wouldn’t be what it was. So here is a list of people I would like to thank. So to wrap it up, this is a must if you want to experience something fun and exciting and full of thrills. I can’t say enough about Whirlpool Jet Boat Tours, and I so can’t wait til I get to do it again. Check out all the videos I have below. Check them out on Twitter, Facebook and on their website. This looks like so much fun. Niagara Fall would be a great place to visit. This sounds pretty cool, thanks for the article. I would love to do this only I get motion sickness. Just have to take medicine before going here. Wow–this sounds fantastic! When I get back to Niagra Falls, I’d love to do this! That looks fun! Next time I’m in the area I’ll have to try that. This is just the kind of thing my sister-in-law is looking to do. Funny though that neither of us thought of Niagara Falls! I’m going to let her know they have this, I’m glad you had a fun adventure. This is definitely something I want to do. I have been planning a trip to Niagara Falls this summer. Sounds awesome! Looks like you guys had a blast! Hopefully my family and I would be able to go there soon. This looks like a lot of fun! I might be scared to try it, but I would probably put my fears aside and go with my family. We haven’t been to Niagara Falls in ages. My nephew is looking forward to the jet boat tour. I hope he’s old enough to go! Fun! It has been years since our last trip to Niagara Falls, we really need to plan to go back soon and have some fun! i want to experience that too. if someday i have a time to do that. Thank you for sharing. I would love to take the family here. This also looks like it would be a very fun boat ride we would all enjoy. OMG! It looks like so much fun! I am adding it to my bucket list. This looks so fun! What a thrill. I loved watching the video of your adventure. Thanks so much for sharing it with us! There is always rush and excitement with the presence of Water! So enjoyable to look at your adventure!